Aside from my affection for the general story of Clay’s sniper rifle aimed at any one who dares to violate the recipe with cumin, it has the added bonus of introducing a technique involving molasses. As a northern sojourner to the American South, molasses was not a familiar product to me. Several things I never knew included (1) there is more than one type of molasses & (2) it has an extensive presence as a condiment in rural area – much of the North sees molasses as an ingredient. The molasses in question for North Carolina is “Sorghum Molasses” which our trusty Wikipedia articles notes is not a “true” molasses. Making sorghum is a dying practice in North Carolina. I imagine more Carolinians are pouring a sweetener on their pancakes made in Vermont or Canada than they are sorghum from Moore County, NC. In broad strokes, molasses is largely thought to be a Kansas City ingredient for BBQ. My first encounter with sorghum came from research into whole hog traditions in Western Tennessee. So to see it pop up in North Carolina was surprising to me. Interesting enough it really only made its way to the coastal regions and affected the barbecue in Brunswick County. A dating of the ingredients probably means that this tradition isn’t really all that old. Carolina BBQ is cooked with direct heat over wood embers. This would run the risk of burning the molasses coating on the meat. The further application to Carolina BBQ would be to try adding it to Lexington style dips – the more liberal of the binary State BBQ styles. The one issue would be trying to keep the sauce thin enough to remain a meet and right vinegar sauce. I imagine some dilution with water will help its case. The buttery smokey complexity of the sorghum instead of using plain white sugar should be well within Piedmont Triangle orthodoxy. The most fascinating discovery I made was the practice of eating hot biscuits with sorghum molasses and butter. Now I have plenty of Southerners who a giggling at me for being so excited at such a commonplace practice down south. I would contend that ubiquity does in no way diminish the sheer genius of this flavor combination. I have personally never seen molasses on biscuits even on my many travels down to North Carolina for research. So for me the vision of hot flaky biscuits sandwiching some complex sweetness with salty butter just generates a sheer amount of excitement. So as we explore more ways of incorporating sorghum molasses into Carolina style BBQ, we can definitely declare hot biscuits with molasses and salted butter as proper breakfast item for pitmasters. The thought process came about in conversations with fellow blogger Biscuits and Such. Here is her biscuit recipe. Cube four tablespoons of butter and, using, your fingers, work it into the flour. I like to smooth the butter out into long, thin pieces. This way, when you press the dough out later, it forms layers of butter between the flour, which is what makes the flakes. Work the butter quickly so that your hands don’t warm it too much. Stir in 1 1/4 cups heavy cream with a wooden spoon, bringing together all the ingredients until they form a rough ball. It should be on the sticky side as it is always easier to work more flour in than it is to fix a dry dough. Sprinkle a little all purpose flour on the countertop and dump your dough out. Using floured hands gently press the dough out flat. I like to work it a little at a time, working it out and then flipping it so that no one area or side gets too worked. Continue to press it out until it is 1/2″ thick. If at any time it starts getting sticky, pop it into the fridge for 20 minutes. 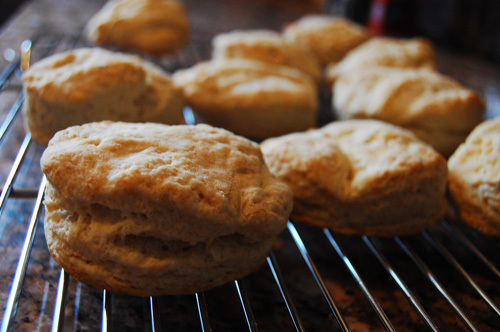 Cut the biscuits and heat your oven to 475, and place them on an ungreased pan. The last thing you want to do before baking is give them a glaze. I like to take the measuring cup that I used to measure out my cream, stick 2 tbsp of butter in there, and melt the butter in the microwave. Then I brush the butter/cream on my biscuits. Bake for 10-12 minutes. Let them rest for 10 minutes before you cut them (any sooner and they’ll crumble). Bourbon Barrel Foods has popular one that uses a 5 generations old recipe. Doubletree Farm comes highly recommended. Call them to see if they’ll do mail order.